Art, food and style combine to create Zone 9. Formerly an abandoned, Soviet-inspired pharmaceuticals factory, Zone 9 is now an enclave for all things hip and happening in Hanoi. Hanoi might be the grand old dame of the Far East with more than a thousand years of history, but it is by no means a staid museum piece. Look beyond the rather clichéd well-trodden path of water puppet shows, war museums and cyclo rides around the Old Quarter and you will find a city charting a new, resolutely modern course. The past year has seen the transformation of an area known as Zone 9, an idealised vision of a socialist-era cooperative. Only a five-minute drive south of the Hanoi Opera House, Zone 9 is slowly morphing from a dull, crumbling, 1960s-brutalist Soviet-inspired pharmaceuticals factory into a chic and eclectic mix of independent cafés, vintage shops and artists’ studios that face the French-inspired Pasteur Park. 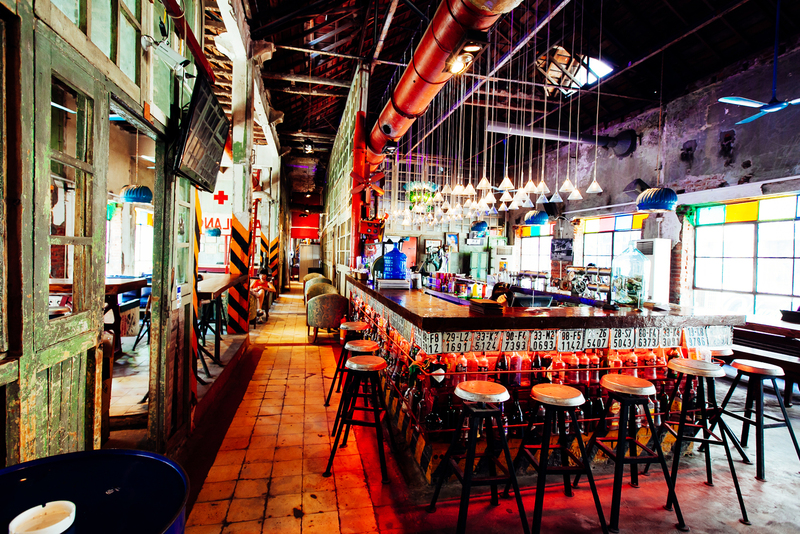 It is Hanoi’s equivalent of London’s Shoreditch circa the 1990s or Beijing’s 798 Art Zone, with elements of Berlin and downtown New York. Zone 9 is a rough ‘n’ ready looking complex of five building blocks, with a cheerful patchwork of architectural styles spanning French colonial grandeur, Soviet kitsch, and post-Soviet and Chinese pragmatism; its walls are pockmarked with the relics of shelves and production lines left over from its industrial past. The glass louvered windows exude 1960s utilitarianism. Old steel pipes from the factory have been reused as flower pots, while concrete slabs are used as working desks, kitchen tables and bathroom shelves. Given the hip vibe it exudes today, it is interesting to discover that a little over a year ago half of the factory was still in operation, whilst the other half had fallen into disuse. The actual factory was eventually relocated to the outskirts of the city, with the original building being earmarked for demolition to make way for a 19-storey apartment complex project. But the project was shelved due to a violation of construction rules, and a subsequent bid to build a parking lot on the site failed due to the unsuitable terrain. That is the point at which Tran Vu Hai, a local interior designer and bar owner, got in touch with the factory’s landlord to ask about renting out a space there. Other tenants followed suit. “This is a dream come true for artists who look for a raw space, a central location and cheap rents,” says Hai. “The good thing is that Zone 9 was born at a time when the real estate sector was struggling and feeling the pinch,” Hai continues. As the first tenant to move into the complex, Hai witnessed how Zone 9 rose from the dust. “When I first walked in, it looked exactly like a garbage dump chock-full of old boxes of medicine” – a far cry from the aesthetic that pervades it today. A tour of Zone 9 is best started at Hai’s Barbetta 2 in Block B. A few years back Barbetta 1, with its vintage and pop-art themes and French colonial villa setting, was a huge hit in Hanoi. Barbetta 2 has a propaganda art theme, and feels more like an industrial warehouse-style nightclub than the mellow bar salon it was originally intended to be. Formerly a medicinal production department, it is now converted into a cavernous space styled after a socialist-era factory from the ’70s or ’80s. Hai has spent years hoarding industrial pieces from used car lots and warehouses in different provinces, all of which have found a home in Barbetta 2: lampshades fashioned out of laboratory glassware funnels, stool legs made from motorbike shock absorbers with upturned frying pans acting as seats, communal table legs ripped from Soviet-era bulldozers. 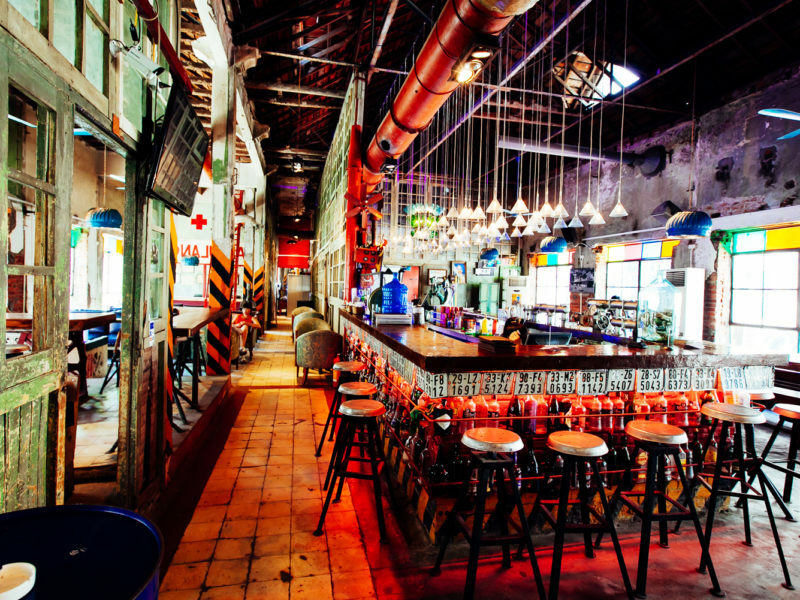 There are two-person tables converted from Petrolimex gasoline barrels, a chandelier assembled with discarded bottles and the bar counter is festooned with motorbike registration plates. At night the mellow café seamlessly transforms into a buzzing music venue. For those after some quiet contemplation and intimacy, Tadioto (meaning ‘we go by car’) in Block A is a better choice. An indie-rock bar established in 2008 as an alternative space for art-loving fanatics, it grew into something of a crossover venue where people gathered to sing, read poetry, play music, drink and socialise. The sudden closure of Tadioto’s first incarnation left a hole in the collective hearts of its followers. Fast forward to 2013, however, and Tadioto has found a new home, bigger in size and bolder in its approach. Scramble up the dusty staircase and you’ll find a versatile space behind an unassuming doorway made out of mattress springs. It opens into a number of rooms: a workspace, an exhibition room and a bar. The eclectic décor represents the multifaceted lifestyle of owner Nguyen Qui Duc, a memoirist, poet, scriptwriter, translator, former US National Public Radio commentator and furniture maker: long curtains cling to huge stained-glass windows, sunlight pours into the room through holes that poke out of grey ceilings, 1970s armchairs stand proudly on the unpolished cement floor, rugged earth red brick walls are lit softly with Moroccan-inspired copper, Cambodian and Indonesian sarong-swaddled lamps. Just a few steps away is Tadioto’s loft exhibition room, which doubles up as a storage space for Duc’s antiques. The vaulted ceilings and plaster walls with their faded grey-green paint provide a perfect backdrop for experimental sculptures, installations, art talks and film nights. This is the place that Duc refers to as “an ongoing effort for exchanging art and culture”. He has brought a dying breed of local craftsmen – carpenters, ironworkers and blacksmiths – on board to create one-off art projects whilst inviting architects from Switzerland, Hong Kong and Japan to work with Vietnamese architects and students. Sharing floor space with Tadioto is Consignista, the place to get your fashion fix. It reclaims one man’s junk as another’s vintage treasure. As its Spanish name suggests, everything here is put on consignment. If you are looking for vinyl record sleeves to adorn your living room wall, are in need of a dusty Lazer drum to fulfill your boyhood dream of jamming with a band, or desire a pair of retro high heels to complete your dancing queen look, Consignista has it all. It stocks just about everything imaginable – kids’ clothes, furniture, homeware products, books, shoes, accessories, clothes and, on the occasion of a recent visit, a full-length wedding gown. Mountains of resale clothes and junk pile up on a long wooden table, on racks and in bamboo baskets for patrons to sift through. If you feel like rolling up your sleeves and digging for treasure, this store will satisfy your hunger for a scavenger hunt. A walk over to Block E finds Workroom Four, a versatile space for work, galleries, workshops and rental studios helmed by four Hanoi-based foreign artists. As well as offering classes in Photoshop and pattern making, Workroom Four showcases urban artists such as Nguyen Van Sac, Rachael Carlson, a shoemaker who adopts traditional techniques of carving shoes, and an up-and-coming local artist who specialises in wood burn painting. “Space in London is very expensive,” says Driscoll. “It’s all been put up for sale for developers and property companies. It no longer exists in capital cities. Zone 9 is definitely a gem, but there’s a lot more retail than I had anticipated. Shops and cafés are growing rapidly. But then again, everything in Vietnam is out of hand,” says Claire. Much like Hanoi itself, Zone 9 is a work in progress but things are moving fast. The hum of drilling jackhammers echoes between the cracked walls, while signboards lie around waiting to be put up. With so much shifting and changing going on in and around it, and with only a three-year lease to date, it is debatable whether Zone 9 will last the distance or simply be swept aside in Vietnam’s pursuit of a very non-communist idea of modernisation. But for the time being, and again, like the city it exists in, it remains a diamond in the rough.